Car crashes are an inevitable part of any driving game. However, few games take the simple phenomenon of an object moving at a high velocity coming to a sudden stop and turn it into a major gameplay element. Yet, for a number of years, humanity’s strange fascination with high octane road accidents was the driving force behind the Burnout series of games, which gained a cult following, then eventually mainstream recognition in the mid to late 2000s. In many ways, the Burnout series was the punk rock of driving games: simple, exciting and, most importantly, focused on providing the most fun possible. The aim wasn’t to give the player an accurate, realistic simulation of driving, like a Gran Turismo or a Forza, but instead to provide maximum entertainment through an arcade style that was highly accessible, but difficult and rewarding to master. You see, the Burnout series, once so successful that Barack Obama paid for campaign advertisements on billboards within one of its games, hasn’t seen a new release since 2008’s Burnout Paradise. Given that the aforementioned game received an overwhelmingly positive critical reception and several awards, this fact may surprise you. So, what happened to Burnout? The simple answer is that, EA (Electronic Arts), its publisher, happened. Rather than allowing Burnout’s developers, Criterion Games, to continue that series or truly put their stamp on their other driving game series, Need For Speed, which had been (and arguably still is) trying to work out what it wanted to be following success in the early 2000s, EA instead chose to fleetingly give Criterion the Need For Speed job for two games (both of which received good reviews), then moving 80% of the studio’s staff to a new Need For Speed developer, Ghost Games and relegating those who remained at Criterion to an advisory role. Many of the staff who left Criterion for Ghost were laid off in 2014, after less than two years and Criterion’s founders, Alex Ward and Fiona Sperry, left what remained of the studio to found a new one, Three Fields Entertainment. This brings us to Three Fields Entertainment’s newest release, Dangerous Driving, billed as a spiritual successor to the Burnout series’ ethos of arcade based anarchy. Now, for those expecting a huge, open world of carnage on the scale of Burnout Paradise, you will be disappointed. 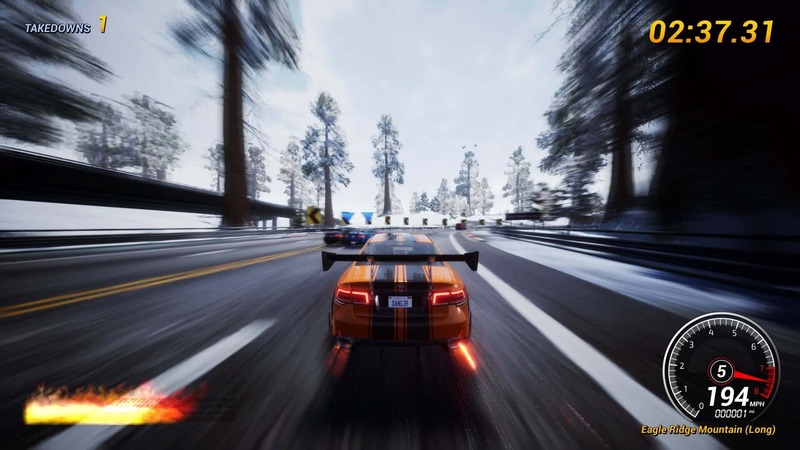 Dangerous Driving doesn’t attempt anything as ambitious as that game, instead taking a more linear format similar to earlier Burnout games, such as Burnout 2 and Burnout 3: Takedown. This isn’t a problem though, as the game’s stages or tracks still have enough variety and length to them to provide a deep experience that doesn’t get old quickly. In truth, this is probably the best way Three Fields could have gone about this task, as given the studio’s relatively small size and budget compared to Criterion with EA’s backing, attempting a large scale open world to try and outdo Burnout Paradise could have been disastrous. Indeed, Dangerous Driving does something very admirable to offset its lack of size compared to most of today’s monolithic triple-A driving sandboxes: it doesn’t feel compelled to charge £60. This may seem like an unimportant detail, but it makes the game a much easier purchase to make in a world where many gamers have trouble justifying spending £50 to £60 per game. Paying £25 for a more compact, concentrated dose of arcade racing is much more reasonable. Speaking of the racing, how does Dangerous Driving stack up to old school Burnout games in this regard? The answer is fairly well. Bringing back most of the popular game modes that made Burnout successful, such as road rage, eliminator and the re-named heatwave mode, the game certainly provides a decent selection of ways to race. The driving experience offered in these modes definitely captures the speed and flow of its spiritual predecessors, but does suffer a little in terms of feel. What do I mean by feel? Well, the Burnout games always succeeded in providing a car that was nimble and manoeuvrable enough to negotiate the challenges of driving into oncoming traffic, but that also felt like it had weight, so when you side-swiped your rival into a bus, it felt like your ramming had put them there, rather than that they’d just cartoonishly bounced off of your car and somehow ended up there. Dangerous Driving sometimes suffers from this, as the cars in the game do occasionally suffer from a feeling of weightlessness, making it seems as though rivals have been taken out by a rogue gust of wind rather than your actions. That said, the driving is still incredibly fun and challenging, made all the better by the combination of boosting and drifting any Burnout fan will remember. The game does suffer from a slight lack of variation when it comes to vehicles. Divided into six classes (sedan, SUV, coupé, super-car, hyper-car and the formula DD class), the game only has one model of car for each category, albeit with a few variations in terms of how highly tuned the model is. This isn’t a massive issue and is one of the easiest to improve upon with future updates to the game. The sensation of driving a wide range of different cars has always been one of the Burnout series’ best features and would augment Dangerous Driving’s fun central mechanics perfectly. Another aspect which is confirmed as being due to arrive via update is an online mode. Currently, only single player modes are available and a well-executed online element will give what should be a thriving community of maniacs a platform to wreck each other and have hours of entertainment. Three Fields might also want to consider adding a local multiplayer mode, as Burnout Paradise’s party mode made for hours of laughs if you had friends or family over and fancied some high octane madness, though I would understand if they didn’t as many games have chosen to ditch local multiplayer in recent years in favour of concentrating on regular online play. Overall, Dangerous Driving is an utter romp and an excellent return for arcade racing in a market dominated by ultra-realistic driving simulators. At £25, it’s much cheaper than most other games and offers an experience more than worth this price, so even if you’ve never tried a Burnout game, I’d thoroughly recommend picking it up. For veteran burners like me, it’s more of a no-brainer than boost-slamming your rival into an oncoming lorry.